JJ Loughran have recently upgraded their onsite balancing and vibration tool to the state of the art IRD Model 258 Series II. JJ Loughran chose IRD technology as their company has over 75+ years of Industrial Research & Development in the field of balancing and vibration analysis, plus both our inhouse balancing machines support their technology. The Model 258 Series II is a versatile, hand-held instrument designed to be one tool with a range of maintenance, inspection, service, and diagnostic applications. This adaptable instrument contains individual modules for FFT Vibration Analysis and Balancing applications, as well as additional add-on modules. This flexibility allows JJ Loughran engineers to perform multiple tasks with a single tool. The FFT Analysis functionality in this equipment is a powerful tool for measuring vibration signals and breaking them down into their component frequencies. Why do we need to balance rotors, shafts and fans? It’s really simple, low levels of vibration indicate low vibratory forces, resulting in an improved machinery life. Minimize vibration – Unbalance is the major source of machine vibration. Minimize structural stress – The forces produced by unbalance have to be absorbed by the surrounding structure. Increase machine & bearing life – The time between outages can be extended if the machine is running smoothly. Increase product quality – Minimum vibration, especially on machine tools, produces better parts. Increase personal safety – Dangers associated with machine failure and exposure to high levels of vibration are minimized. Increase productivity – Machines running smoothly have more “uptime” availability. Lower operating costs – Extra machines are not required “just in case” of breakdowns. Spare capacity is kept to a minimum. Energy consumption is reduced. The IRD Balancing® Polymate data analysis and reporting manager is a software application tool designed to transfer, display, and store data from the Model 258 instrument. 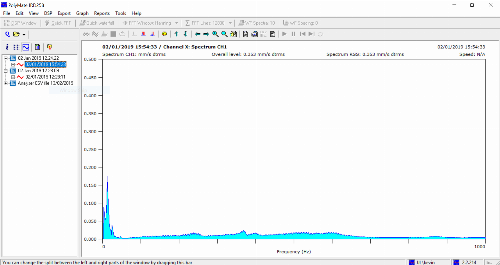 This software allows JJ Loughran engineers to easily download data from our instrument straight to our inhouse systems. Data downloaded is then transferable to the Polymate software for further analysis, manipulation, and editing. From there, reporting is as easy as exporting data to the pre-defined JJ loughran report templates setup within Polymate. These functionalities provide a seamless interface between instrument, data, analysis, and reporting - making customer satisfaction simple. If you have any equipment that needs balanced please do not hesitate to contact us.